Inquiry question: What is the story of my great grandmothers ring? First, some backstory on my object. When my grandmother was 12 years old, my great grandfather gave a ring to my great grandmother. He bought it at the department store he worked for, Sears (the first Sears in BC). The ring has been passed down through my family for generations. Soon, when I am old enough, I will get the ring from my mom. Source: The ring is a primary source, because it is an artefact. The producer of the ring is unknown, however it was purchased at a Sears by my great grandfather so it was likely mass produced. Context: The ring was bought in the mid 1950’s, around ten years after the Second World War. This is important because in the Second World War, a new plastic made from acrylic resin, called Lucite, was developed. Lucite was used in aircrafts in the war, but once the war ended, there was no use for it anymore. Jewellers bought it and started to make rings and fake gems with it, as it was much less expensive than actual jewels. The ring that now belongs to my mom is made from Lucite, which shows how the object was influenced by events that had happened around the time the object was created. Description: This source is important because it is a family heirloom, and it has been passed down for generations. It symbolizes my heritage and my family history. What I find interesting about the source is the writing on it. On the inside of the ring, there is a word or an initial scribed into the gold. It looks like it is written in Arabic, or some other foreign language. I can’t read it, and neither my mom or my grandmother know what it says or means. This is also something that I can’t explain about the artefact. Inferences about perspective: This writing shows that the creator may have been of Arabic decent, or the writing was carved in after the ring was bought. I think that the creator made this source to get payed. If the creator didn’t make this source, than they would probably be fired. This ring was created for anyone looking to buy a ring. My great grandfather happened to be the audience, as he was looking for a ring as a present for my great grandmother. The background and values of the creator could have influenced the source because the creator most likely write something in another language on the artefact, wether it be his initials or a word. The background and values of my grandfather could have influenced the artefact because if he had been from another background or had different values, he might have believed that rings weren’t a proper present to give. He might have instead given my great grandmother a dress, or some chocolates. If my grandfather had had different values, the source may not still be in my family (and may have never been in the first place). Inferences about inquiry question: From examining the source, I have learned about the type of jewelry that was popular in the 1950’s, and that the creator of the artefact was most likely from a foreign country. This does help me to answer my inquiry question, because the more I know about my object, the more I am able to answer my question. What I have learned extends what I know, because I was aware that the large jewel was not real but I didn’t know that it was made of Lucite until further examination and information from secondary sources. What I learned did not tell me if the smaller diamonds on the side of the ring are real or not. I know for a fact that the gold is real, but the jewel is not. Therefore, I have no simple way of figuring out wether the diamonds are real. Some further questions I have are, what is written on the inside of the ring? Are the diamonds on the ring real or fake? 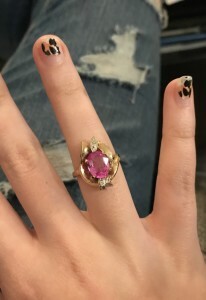 Why did my great grandfather choose this particular ring to gift to my great grandmother? Was there a special occasion that required my great grandfather to give the ring to my great grandmother? Is the ring worth more now than it was when it was purchased over 60 years ago?